CHICAGO (AP) The slumping Chicago Bulls may have seemed like the more desperate team, but Zach Randolph thought the Sacramento Kings needed a win just as badly. 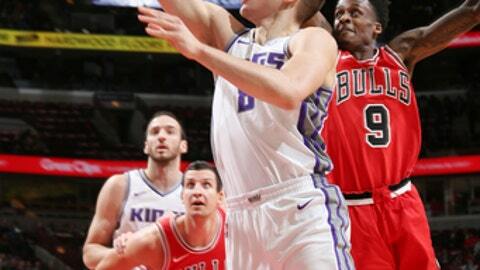 Randolph had 25 points and 13 rebounds, Bogdan Bogdanovic scored 19 points and the Kings beat the Bulls 107-106 on Friday night, extending Chicago’s losing streak to eight games. ”Everybody’s desperate right now – especially us,” Randolph said. ”It’s tough getting road wins,” Randolph said. ”Any team it’s tough, trying to go into their place to get a win. It was the second straight night the Bulls lost by a point, although Friday’s game ended with a meaningless 3-pointer at the buzzer. Chicago’s last win was a 123-120 decision against Charlotte on Nov. 17. Cauley-Stein also contributed with tough defense on Markkanen down the stretch as the Bulls came up empty on three straight possessions in the final 2 1/2 minutes. The Kings and Bulls are rebuilding with a host of athletic high flyers, but Randolph, the old-school big man, controlled things with his ground game. With the losses piling up, the Bulls’ biggest challenge might be to avoid focusing solely on the streak. ”That’s the thing we talk about with this group all the time,” coach Fred Hoiberg said. ”It’s not about looking at the wins and losses. It’s about taking steps in the right direction every day. It’s about going out and competing every night and giving ourselves a chance. Kings: Rookie F Justin Jackson and second-year players C Georgios Papagiannis and G Malachi Richardson were assigned to the Reno Bighorns of the G League. ”It’s a developmental tool for them to be able to play,” Joerger said. Bulls: F Bobby Portis (right arm) was scratched just before game time. … F Nikola Mirotic – sidelined with a facial fracture following a preseason fight with Portis – practiced with the Windy City Bulls of the G League for a second straight day on Friday and could be activated on Monday. ”A lot will depend on how he feels (on Saturday),” Hoiberg said. ”He’ll come in and get some shooting (on Saturday) and, hopefully, we give him a good workout on Sunday, and we’ll take it from there.” … G Zach LaVine (knee surgery) also practiced with Windy City on Friday. His return date remains uncertain. Kings: Visit Milwaukee on Saturday night. Bulls: Host Cleveland on Monday night.